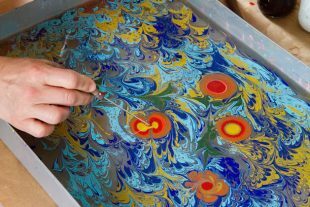 Marbling, or ebru, is one of the most popular forms of Turkish art. We decided to introduce ourselves to the technique, and joined a workshop offered by Les Arts Turcs in Sultanahmet. By the end of the entertaining session, we had managed to create a few minor masterpieces.